On November 19, Joshua Clottey (35-4, 20 KOs) is finally making his return to the ring to face Calvin Green (21-6, 13Kos) on the off-TV undercard of Julio Ceasar Chavez Jr vs. Peter Manfredo Jr. at Reliant Arena in Houston, Texas. It will be Clottey's second trip to the Lone Star state, the first being a lopsided unanimous decision loss at the hands pound-for-pound champion Manny back on March 10, 2010. Whether it was the embarrassment from his performance or legal dispute with his former manager, Clottey seemingly disappeared from the public and went into hibernation for an extended amount of time after that fight. Although he only he threw a total of 20 punches in that fight (I'm kidding on that number), Clottey pretty much landed them all, making Pacquiao's face after the fight look like he had been in a football game without a helmet. If he had actually let his hands go during the encounter, perhaps he would have given Pacquiao a much more competitive fight. That being said, a high punch output has never been the strong-point of Clottey, who's known more for his defensive shell than his offensive attack. Now that his legal problems with his former manager are behind him, Clottey is looking to come back with a higher offensive workrate, the one thing that has prevented him reaching the elite level. Case in point, in June of 2009, in a fight that he was winning early on the scorecards, Clottey let Miguel Cotto off the hook in the later rounds. Just when it looked like he was on his way to solidifying his position as one of the best fighters in the division, Cotto stole the final rounds by potshotting from the outside as Clottey struggled to cut off the ring and failed to let his hands go. With renewed focus and dedication, however, Clottey is said to be looking even stronger than before he's determined to exert a high offensive output. If the whispers are true and Clottey can indeed increase his punch output and still maintain a good balance of defense, I will be the first to say that he'll be able to compete against anyone. 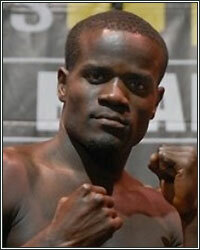 His strength, great chin and overall size will make him a threat to any of the 154-pound champions. In fact, with a new attitude and a new arsenal of offensive weapons, it's not out of the question that he could get a title shot some time next year if someone decides to take a risk, a big risk. I'm sure he wants a rematch against Cotto or Margarito, but with a higher output of offense, would either one of them want to chance it? Until he wins a title, it would be a high risk, low reward encounter for anyone facing the return of the Grand Master.